Adi Shankaracharya propagated the idea of Hinduism through Advaita Vedanta and the town of Rameshwaram stands as a testimony of his faith. One of the four pilgrimage places, Char Dham of India, it modestly invites followers of Lord Shiva from everywhere to pay visit at least once in their lifetime to the Jyotirlinga installed in the Ramanathaswamy Temple. Vaishnavites are also not left in their devotion to come to this place which is believed to be associated with Lord Rama, incarnation of Lord Vishnu as well. Located in Ramanathapuram district, the town is a part of Pamban Island also known as Rameshwaram Island being associated with the legendry temple built in marvelous Dravidian style of architecture. 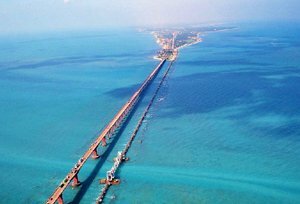 Situated at the very tip of the Indian peninsula, the island is connected with Indian mainland by Pamban Bridge on Pamban Channel in Gulf of Mannar. A visit to Varanasi in Uttar Pradesh is not considered complete in terms of pilgrimage if not coupled with a trip to Rameshwaram which is said to be the Varanasi of South. Welcome to the charm that devotees come to associated with an abode of God irrespective of the place it belong to. The town has been changed many hands; main amongst them were Cholas, Jaffna Kingdom, Allaudin Khilji (Malik Kafur), Pandya Dynasty, Vijayanagara Empire, followed by some other rulers who ruled the town for a very short while before British East India Company directly took over it and made it a part of Madras Presidency. The Rameshwaram Temple which is the main reason the town is known to every other person following Hinduism, Lord Shiva and Lord Vishnu is said to be built by Sethupathis of Sethukavalan - custodian of the legendary bridge built by Lord Rama when he crossed the sea to reach Lanka (now Sri Lanka) the place in the control of Demon King Ravana, also a Brahman. Rameshwaram is believed to be the place from where Lord Rama started his journey to get his wife Sita back from Ravana and the Lord was helped by 'Vaanar-Sena' army of legendary monkey-humans and served by Hanuman, Lord Ram's paramount devotee. Also, many later versions of Ramayana testify of installing a ShivaLingam by Shri Ram and Devi Sita to worship Lord Shiva as a part of penance for Brahmahatya - killing of Brahmana, Ravana who was himself a well-known staunch follower of Lord Shiva. The Rameshwaram Temple, built in 12th century is believed to have the same Shiva Lingam. The bridge to Lanka named 'Rama Set	u', also known as Adam's Bridge is of religious as well as ecological importance. Some 30 Km long, it was supposed to be passable on foot till 15th century after which a storm deepened the channel. 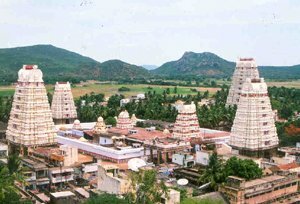 Ramanathaswamy Temple: 'Ramanathaswamy' literally means 'the Master of Rama' which refers to Lord Shiva, which the temple is all about. There are two 'lingam' inside the temple; 'Ramalingam' by Devi Sita built by sand and 'Viswalingam' brought by Lord Hanuman from Kailasha (abode of Lord Shiva) and installed by Lord Rama. Temple tanks, hall of 1000 pillars, and several other shrines in the temple attract millions of pilgrims every year, especially during Maha Shivratri. 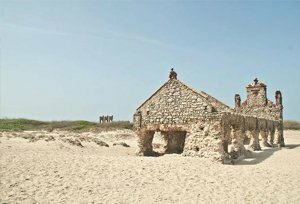 Dhanushkodi Temple: The southernmost tip of Rameshwaram is known as Dhanushkodi, where Kothandaramaswamy temple is located. The place was often ruined by cyclones but never displaced a single stone of the temple and of faith, thus. The place is where Vibhishana, brother of Ravana surrendered to Lord Rama. Enchanting location make the visit to the place and the temple as pious as God has made it. Agni Tirtham - A large lake and 22 wells with unique-tasting waters make it an important pilgrim place where they believe to get cured by the curative properties. Ram Tirtham (Gandamadana)- worshipped by many communities of south India. Lakshman Tirtham - Built inside Rameshwaram to give the brother of the Lord the place he rightly deserved helping his brother in the holy war against Ravana. Jatayu Tirtham - Commemorates the memory of Eagle God who assisted Lord Rama in his fight for Devi Sita. Kaveri and Jada Tirtham - A place is meant to worship for god Kapardikeshwar and a Peepal tree representing all the deities. 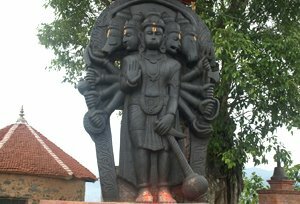 Panch - Mukhi Hanuman Temple: Lord Hanuman, Lord Adivaraha, Lord Narasimha, Lord Hayagriva and Lord Garuda are the five faces that were revealed by Lord Hanuman at the sacred site, where the present day temple stands. Another attraction of the temple is floating stone used for building temporary Sethu Bandhanam to reach Lanka. By Train: Mandapam station is just 2 Km away from the temple and brings travelers from Chennai, Coimbatore, Trichy and Thanjavur. By Road: Regular Bus services make travelling to the temple town easier and for many, convenient. Places like Nagpur, Hyderabad, Madurai, etc are can act as 'via-points' for those coming from northern part of India- buses, cars or taxis.